Two miles south of Uffington, near Wantage, Oxfordshire. Uffington Castle is situated upon the Ridgeway, the ancient road that follows the high ground from the Chiltern Hills to the South Coast. It sits on the northern face of the Berkshire Downs, like Segsbury Camp, its neighbour to the east, and affords very clear views of the surrounding horizon, especially anticlockwise from the north-east to the south-west. The fort is defined by a single rampart in the shape of a rough pentagon, enclosing a very conservative 8.25 acres. In its heyday, this rampart would have been about 3 metres deeper than it now appears, and rather than being lined with grass, its bare chalk construction would have been exposed, making it an extremely imposing sight on the landscape. There are several paths which lead into the fort, as can be seen on the aerial photograph below: the north-eastern and south-eastern are more recent and may have their origins in Roman times, but the original entrances are in the centre of the western and eastern ramparts; though the latter is not so obvious today as it was blocked off during the Roman era. The site has not been accurately dated, but archeological finds suggest that the fort was constructed during the Late Bronze Age or Early Iron Age, very vaguely around about 8-700 B.C. Pottery found on the site suggests that the fort was used in some form throughout the Iron Age and into the Roman era. So far so little that is extraordinary. 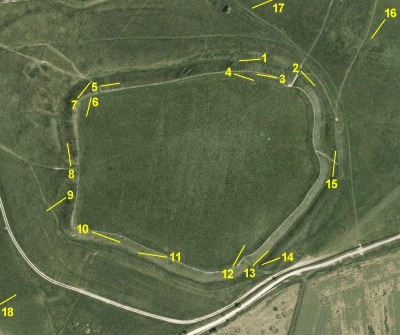 Uffington Castle, however, is a startling oddity amongst Hill Forts, primarily because, unlike its neighbours, it never appears to have been densely populated, despite there being evidence for buildings inside, nor was it permanently occupied. Archeologists are now looking at the possibility that it is not so much a defensive structure, rather a spiritual centre. One only has to step outside the fort to get the impression that this site is a little different. Just a few yards beyond the north-eastern entrance is The White Horse, a remarkable chalk monument cut into the side of the hill, and below it is Dragon Hill, a natural chalk outcrop that may have been sculpted by man, and the Manger, an extraordinary feature that was formed during the last Ice Age. A little further afield, a walk of 1¼ miles along the Ridgeway will bring you to Wayland's Smithy, a splendid Neolithic burial chamber; although built by a much earlier people, probably for long forgotten reasons, it may well have retained its mystical significance to those at Uffington Castle. It is not hard, therefore, to imagine why pilgrims may have been drawn to this place. It must have been an area of great spiritual importance for long time, and to very different peoples; indeed it continued to be frequented by Victorian "pagans" and was used for their festivals from the 17th to 19th Centuries, the last being held in 1857. Of a much older time than both these fetes and even the fort itself are the Neolithic burial mounds that can be found on the path between Uffington Castle and the White Horse; excavations on the largest, the pillow mound, revealed 50 skeletons, many with their skulls missing. Most unusually, some of these burial mounds were reused during the Roman and Anglo-Saxon eras.